Eyebrows are a part of the face that seem insignificant but can make a huge difference in your appearance. Full, perfectly groomed brows can make a world of a difference when it comes to accentuating your facial features and enhancing your eyes. It can even take years off your face! 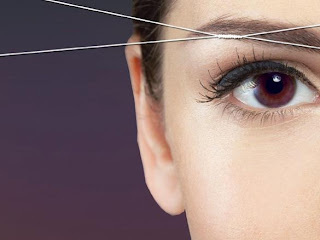 In comparison to waxing, eyebrow threading (which is offered at nuBest) is less irritating to the skin (it doesn't remove the top layer of the skin like waxing), more accurate and ensures that the hair is removed from the follicle. Additionally, the threat of being burned by wax that is a little too hot is eliminated! Located near the coloring department, the Eyebrow Bar boasts trained and skilled "artists" that take your eyebrow thickness and shape into consideration before starting to thread. Throughout the threading, he/she stops and allows you to check to see if you are happy with the shape of the brow and to reassure you that they are not threading too much hair. For first time clients, Eyebrow Shaping goes for $25. Then, when hairs start to grow in, come back to nuBest for a Eyebrow Clean up for $15! For some tips, check out celebrities and their eyebrow shapes, and how eyebrows can make a world of a difference (especially on the red carpet! ).